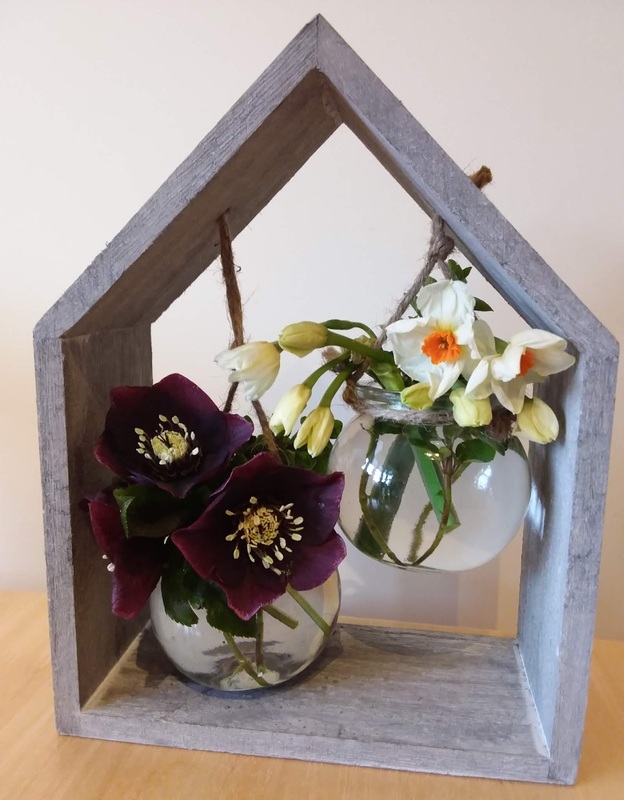 This post isn’t a ‘how to make’ a cut flower garden, rather it’s tips that Jonathan shared at a South Pennine Hardy Plant Society talk, 6th March 2019, based on his over 20 years experience. My first attempt of some cut flowers from my garden using this small flower display stand. and the white with orange trumpets are Narcissus 'Cragford'. The foliage, which you cannot hardly see(! ), is Oregano. When picking flowers, bring along a bucket and put each flower you pick in water immediately. This helps retain their freshness and longevity. The general rule is, cut Narcissi (daffodils) ‘on the flat’, meaning a straight cut, and everything else, at a 45 degree angle. Some people make the mistake of not picking in their cut flower garden because they loose sight of the reason they planted it, and think cutting it will spoil it. No – keep cutting and the plants will keep producing more flowers! Sweet peas are an excellent example of this: if you don’t cut them, it will stop producing and go to seed very quickly. Use foliage first as a framework. 80% foliage, the rest flowers. A great cut flower are Astrantias. After they finish flowering, cut them hard, to the ground, and you will get a 2nd flush of flowers in about 6 weeks. I checked about the cutting hard part and he said yes, try it! If you want to have Hellebores are cut flowers, score the stem down 2 sides with a sharp knife and they will last longer. A wonderful winter cut flower is Lonicera fragrantissima which flowers in winter and spring. I can add Lonicera x purpusii 'Winter Beauty' to this. For both, the fragrance is wonderful. He uses Ivy a lot in his floral arrangements and loves it. He says, despite the bad press ivy gets, it's not definitive as to whether ivy can actually kill trees. I did some research into this after the talk. I found that the general view appears to be that its presence on a tree trunk is not damaging, and where it grows into the crown this is usually only because the trees are already in decline, or are diseased and slowly dying. See https://www.rhs.org.uk/advice/profile?pid=192 for more info on ivy and when you do need to control it. Another good evergreen foliage plant is Choisya ternata 'Sundance', where the tops of each stem are flushed yellow and slowly fade to green. When tying up your bunch of flowers/foliage, tie it where you were holding it. 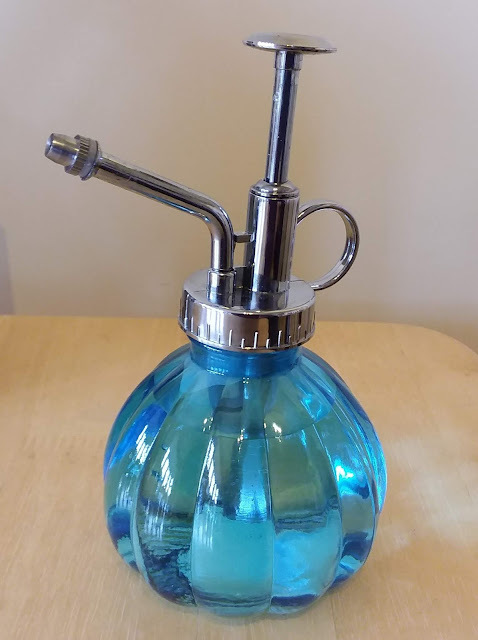 Spray the arrangement morning and evening with a mister, such as in the photo below. He highly recommends the RHS Cardiff flower show as a great Spring event for getting ideas for your garden. Jonathan said more than this and also did several demonstrations on creating cut flower posies and displays, but I wasn't able to capture everything! He was a great speaker and a font of knowledge. If you get the chance to hear him talk, I highly recommend it. I didn;t know about the 45 degree cut, must try it out.